Our elegant restaurant offers excellent Irish cuisine, enhanced by a carefully chosen and imaginative wine list. Menus are all designed by our Head Chef, who relishes in using wonderful natural fresh produce, much of which is available in the area. 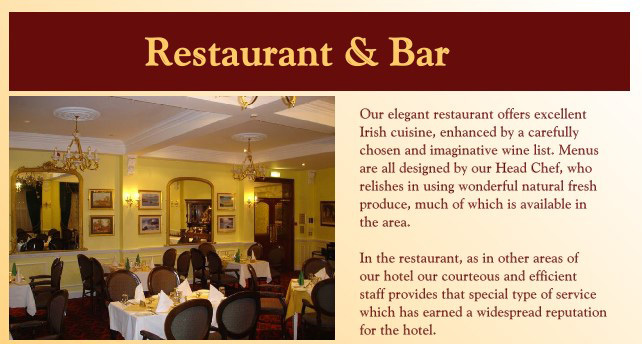 In the restaurant, as in other areas of our hotel our courteous and efficient staff provides that special type of service which has earned a widespread reputation for the hotel in Donegal. The Assaroe Lounge is a spacious bar, named after the famous Assaroe Falls that graced Ballyshannon in earlier days.